We thought now would be a great time to give everyone a little update on the occupation. We apologize if information has not gotten out as effectively the past few days, but many of us have been busy building the infrastructure at the site and have not had internet access. We now have a more or less set schedule and expect to keep this consistent for a month or more. Monday: Media committee meeting at 6:30 p.m.
Wednesday: Infrastructure committee meeting at 4 p.m. and GENERAL ASSEMBLY at 6 p.m.
Thursday: Weekly March from City Plaza to financial district in downtown Reno at noon. Saturday: GENERAL ASSEMBLY at noon followed by community activities, teach-ins, etc. Sunday: Legal committee meeting 1-2 p.m., Issues Forum at downtown library auditorium from 2-5 p.m. Please feel free to show up any time day or night to stop by and visit, donate supplies, camp, or offer ideas. 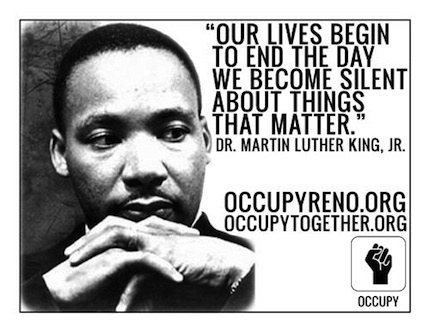 The best way to get involved at this point is to actually occupy. Even if you can only come for half an hour, please do. Newly named “Moana Springs” (formerly Moana Pool) is a growing community, and we need you to help get the infrastructure built so that we can focus on the next step. We currently have a camping area with about 15 tents including one community tent, 12 portapotties, a 32 ft. diameter geodesic dome for information and media, a people’s library with hundreds of books, ample parking, grass space for activities, a food-prep area to bring your own food and cook at, and a fire pit circle to keep us warm at night. Right now we especially are in need of firewood, fire pits, non-perishable food, warm clothes, blankets, tarps, and your company! We encourage you to commit to just one day a week of overnight occupation in the next week if you can! You don’t have to be a 24/7 occupier to help, and even just one day will help you really get a feel for the movement and help the movement decide the direction of action from here. We look forward to having your voice in our nightly chats around the fire as well as at any of our events and/or meetings! 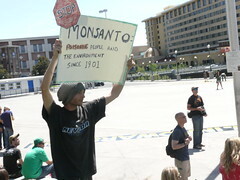 We began our occupation of Moana Pool (now Moana Springs) on Friday, 10/28/11 at approximately 10 AM. 3 days ago……..
We will have an active internet connection by 5 PM today 10/30/11 so updates will be happening more frequently. Those of us onsite have been too busy getting our infrastructure up and were not aware that no official announcement of occupation had been made sooooooo…..
Those interested in our movement who wish to discuss issues – local, national or global – are invited to come to the Reno Downtown Library auditorium on Sunday, 30 October, from 2pm – 5pm. They can be issues that seriously need change or issues to better the quality of life. We will initially agree on meeting procedures, then dive in, improving the process as we go. We will maintain a list of issues, status, proposals, etc., and email it to attendees afterward. We will also post the log from each meeting. The room has a projector so speakers are welcome to bring a flash stick with charts or other information. It also has open wi-fi. We’ll probably agree to limit speakers to 3 minutes to insure an active discussion because this is only a beginning. As our movement progresses, there will be sessions for in depth discussion and education on particular issues. Where there is due consideration over time and broad agreement, we might reach solutions and proposals that could be presented to the general assembly for a vote. There is no formally stated goal of the Occupy movement, however, it is safe to say a major thrust of it is to make the laws, regulations and policies of the land serve the broad population, as oppose to favoring the wealthy (people and entities). That leads to a happier, healthier, more educated population, which, in turn, builds stronger communities and nations. We CAN fix our nation. Hope to see you Sunday! Hi everyone! This is Lauren from the Tech committee. We are currently updating the website (particularly menu items above), so please be patient. We’re getting there! Slowly but surely! On Friday (10/28) from 10 AM to noon you have the opportunity, indeed the privilege, of participating in a work detail at our soon-to-be home at Moana Pool. We need to clean up cans, bottles, debris, underbrush, etc., in prep for the occupation. Don’t miss this exciting opportunity! 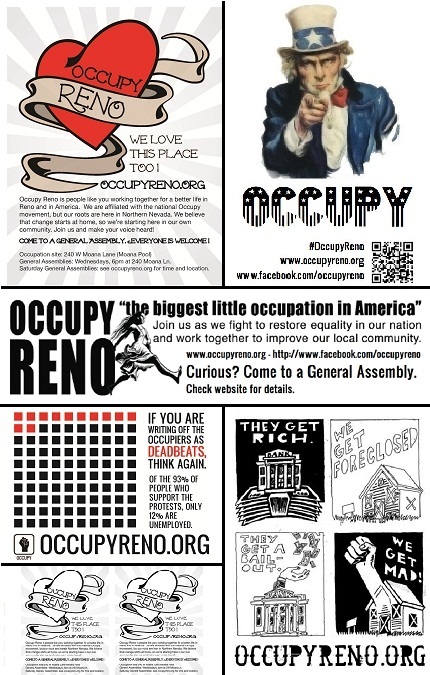 If you can make it, please send a message to volunteer@occupyreno.org. Thanks Reno! Here is the agenda for our GA tonight! Look it over if you have time or print off a copy or two for others to have tonight if you have the means. Once again, it is at 6 p.m. at 240 Moana Lane. See you soon! 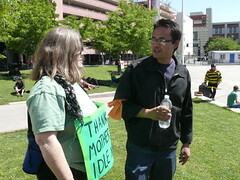 Today was a great day for Occupy Reno and the Occupy movement as a whole! We were on the agenda for the City Council meeting today at 12:45 p.m. We applied for a 30-day permit for dual occupation at 240 Moana Lane and the old bus station at 4th and Center St. and were petitioning to have the permit fees waived. Councilman David Aiazzi made a motion to grant us a 90-day permit for both locations with absolutely no fees. The council approved a 90 day permit for the Moana pool site only, and the original $35/day fee was dropped because that particular site was not currently on a fee schedule, pending fire and health code approval. Furthermore, David Aiazzi himself agreed to pay the $103 permit application fee for the occupation. The bus station was not approved at this time for several reasons. One reason was that Occupy Reno did not have a separate insurance policy for this site. In addition, we were only applying for a daylight occupation here, not a 24/7 occupation as with the Moana site. RPD as well as the City had concerns about not what would happen when we were there, but what would happen when we were not there (i.e. : homeless at night). Several councilmen expressed interest in taking down the fence in the near future and making this plaza a public space as well as a free speech zone in which anyone, including Occupy Reno, can use for their purposes. This issue will be addressed in a later City Council meeting. According to Jamie Schroeder, Senior Management Analyst for the CIty of Reno, the permit for 240 Moana Lane should go through by 5 p.m. tomorrow (10/27) if Occupy Reno can provide proof on insurance, health and fire code compliance, and a waste removal plan. We have been working nonstop to ensure these things are accomplished by tomorrow and do not foresee any problems. Thanks to everyone who made it to City Hall today to support this movement and a special thank you to everyone who spoke during the meeting. We had support across the board without any one race, gender, or socioeconomic category more represented than another. Everyone spoke with such passion and articulation of their ideas. Several of us were holding back tears. We truly are united in this! Furthermore, we listened as several members of the council defended our position, fought to have our permit extended to 90 days, and claimed that they too were part of the 99%. We will be holding a General Assembly at 240 Moana Lane at 6 p.m. Thursday 10/27- tomorrow! If our permit goes through, we will begin occupation immediately following the GA. Either way, the main issues on the agenda will be organization of the occupation site, gathering of supplies, safety and comfort, and anything else you would like to bring up related to the actual occupation.